Prior to their debut, CHI CHI held a showcase to promote the release of their single "장난치지마" ("Don't Play Around") on March 18th. At the event they performed in front of news reporters as well as partaking in their first press conference MC'd by actress and label-mate Hong Soo Ah.The group's MV was released on March 18, 2011 co-starring actor Lee Jong Suk of Secret Garden . CHI CHI then made their television debut on SBS 's Inkigayo on March 20, 2011. After several performances, the members begin receiving several requests from producers to appear on variety shows.They have also been featured in the wildly popular dance game " Audition Online ". CHI CHI revealed in an interview for plans to return with a new single in May.Since then, plans were delayed and now have set their comeback for a July date.They have also gained an endorsement deal with “Yoheim Smoothie”. The single titled "Longer" was released on July 21. The single features 3 different versions of the title track. The MV was also released on the same date.The song peaked at #66 on the Gaon's weekly digital chart. CHI CHI made their foray into reality television with ETN's "Hot Shot" (a reality series featuring rookie idols). "Hot Shot" showcases behind the scene episodes revolving around CHI CHI and their daily ventures. The first episode premiered on August 12th.Rookie boyband HITT also made a guest appearance on the show. 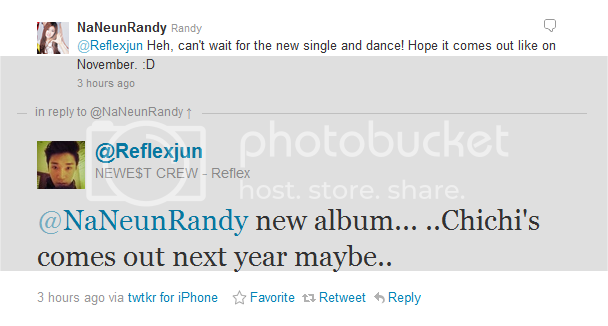 Reflexjun, choreographer of Yedang entertainment, revealed on twitter that CHI CHI could possibly comeback with an album next year. On November 23 of 2011, Yedang company announced CHI CHI's participation in Yedang company's first overseas concert in Asia & America.CHI CHI has also appeared on Japanese television programs such as "Star VJ Show"and "K-POP IDOL Toryumon". On December 12, 2011, it was revealed that Nara, Peach, and Ji-U were no longer members of CHI CHI and that a replacement member, Shine, was added. Sui became CHI CHI's new leader due to the departure of their original leader, Nara. CHI CHI will be debuting in Japan with their debut single, "からかわないで!!" ("Don't Play Around") which is the Japanese version of their debut single in Korea, "장난치지마" and is set to be released on April 25th through Japanese record label Tokuma Japan Communications .CHI CHI will be holding showcases called "Shibuya CHI-CHI Festival" in Japan every month until their official debut single release.CHI-CHI's first Japanese single, "からかわないで!!" debuted at #39 at the Oricon daily chart. The current peak for the single reached #25 on the Oricon daily chart. Trophy Entertainment revealed that CHI-CHI will be shooting their Korean comeback music video on June 1st. They are schedule to make a comeback on mid June.